When implementing change, you'll hopefully be aware that working with the people affected as far as is possible is key to success. A helpful way of thinking about is inviting people to be investors rather than making them 'buy in'. 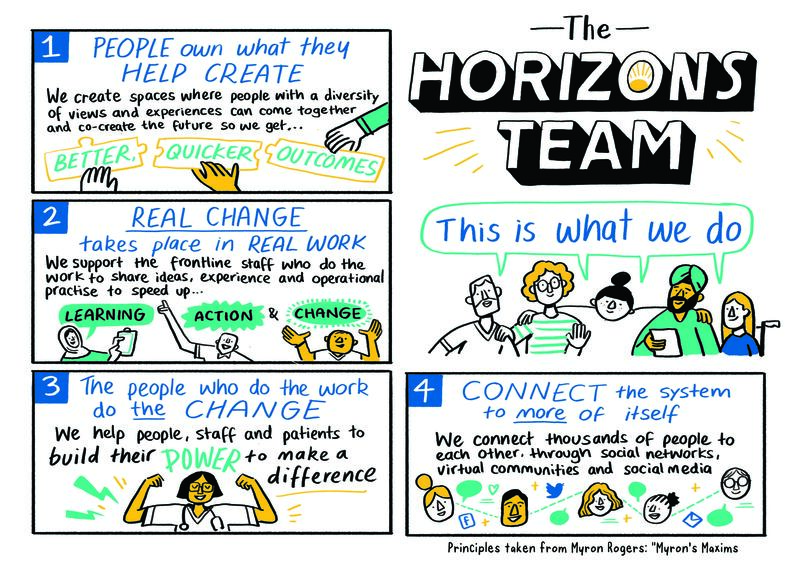 We in Horizons work with this principle in all of our projects (such as #ProjectA and Transforming Perceptions of Nursing and Midwifery) - it's part of Myron's Maxims, which you can find out more about in the image below. When introducing change, it's tempting to focus purely on the benefits of that change. In many ways, it makes sense: the change will make things better, otherwise why bother? In reality though any kind of change can feel unsettling. Put it in perspective: even a change that has been instigated by you and will be positive, such as starting a new job or moving house will be stressful. So when the change is something that is happening within your organisation and impacts on your job and the way you work - whether it's a organisational restructure or a change of practice - life can feel very uncertain. That's why it's important to emphasise what will remain the same. As the research in the article this post discovered, staff care for, value, and identify with their organisations. Disparaging the 'old' world in favour of the bright shiny new world ahead could feel like an insult. Insulting people is a great way to make them feel disengaged, resistant, and disenfranchised, the exact opposite of what you want! Irrespective of the nature of the change or the reason for it, there will be some things that remain - and good things about the current state to celebrate. When planning your change, you'll be devising on a communications and engagement plan. As part of that plan, you'll have some key messages that outline what is changing and why; and what things are envisioned to look like in the future. You'll articulate how two-way dialogue will happen throughout the process. An effective communications plan will also include key messages outlining positive things that staff and the organisation is already doing, and for those things to continue: the exact nature of those messages will depend on the circumstances of the change and your organisation. 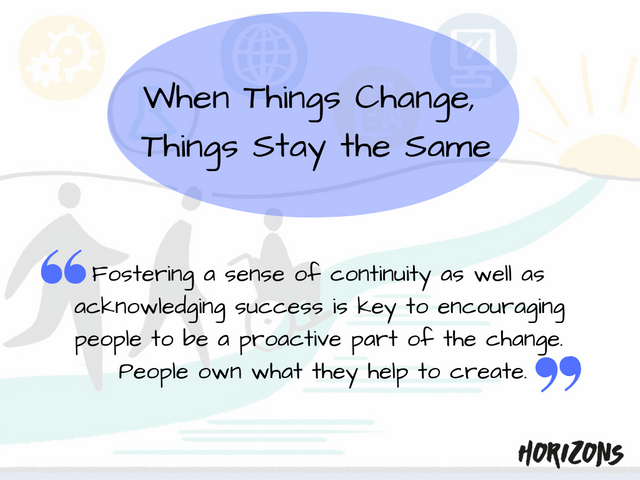 Fostering a sense of continuity as well as acknowledging success is key to encouraging people to be a proactive part of the change. Remember, people own what they help to create.